Aaron's Food Adventures | Food Reviews | Spicy Food Challenges | Food Restaurant Critic: Melt It! Melt It! 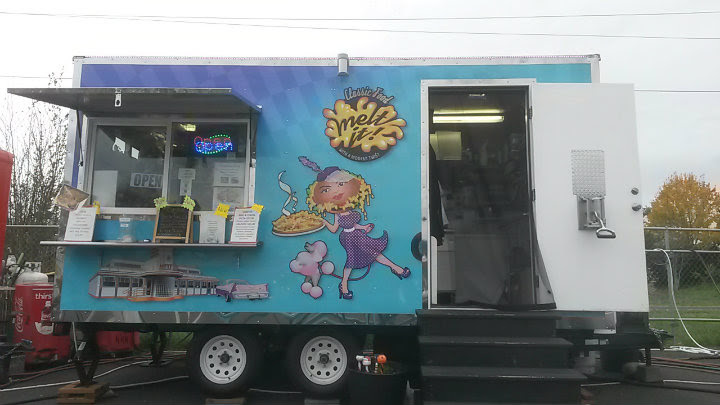 is a food cart located at the Cartlandia food pod in Portland, Oregon. This cart opened around April 2014 and has been a fixture toward the back lot of the pod. If you are craving something gluttonous, this is the ideal cart for you. The menu focuses heavily on their signature mac and cheese (with a 3-cheese blend and penne) -- and the owner puts that mac and cheese on and in almost everything. 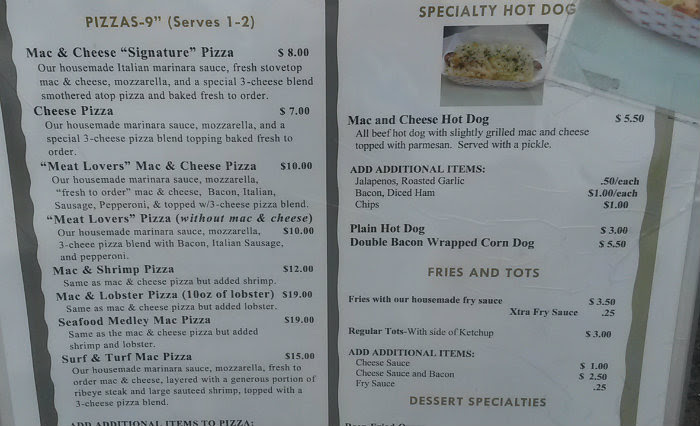 It's one of the very few times I've seen mac and cheese on hot dogs and burgers, and probably the only time to date I've seen mac and cheese on pizza or inside a calzone. Carbs for weeks here, folks. 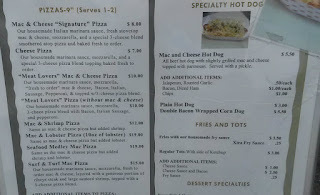 All mac and cheeses are served in an individual serving tray with a breadstick, or you can get the mac and cheese in a bread bowl for a few bucks more. If you want that bread bowl, be sure to get there quick; only about 8 bread bowls are available. Non-meat add-ons (i.e. 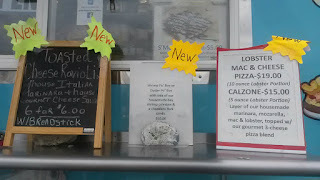 basil, jalapenos, roasted garlic, or tomatoes) are 50 cents extra, and meat add-ons (i.e. 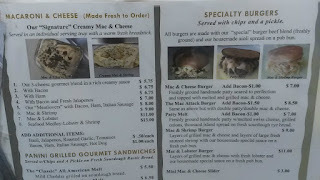 bacon, ham, Italian sausage, or hot dog) are $1 more. 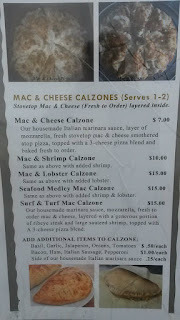 I ordered the Lobster Mac ($11). 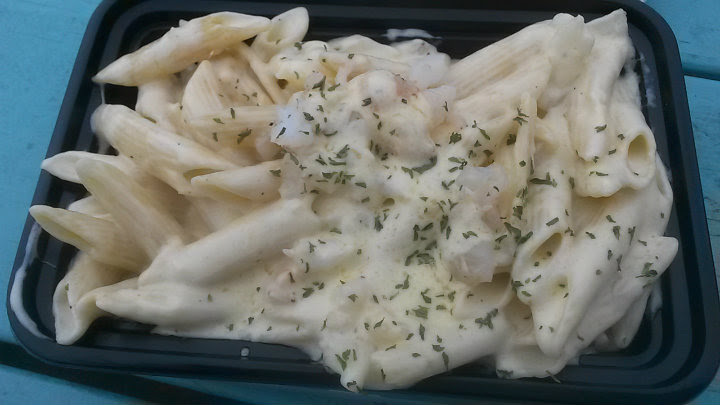 Transparent, diced lobster was placed on top of the mac and cheese. It's a very good -- and very cheesy -- mac and cheese. 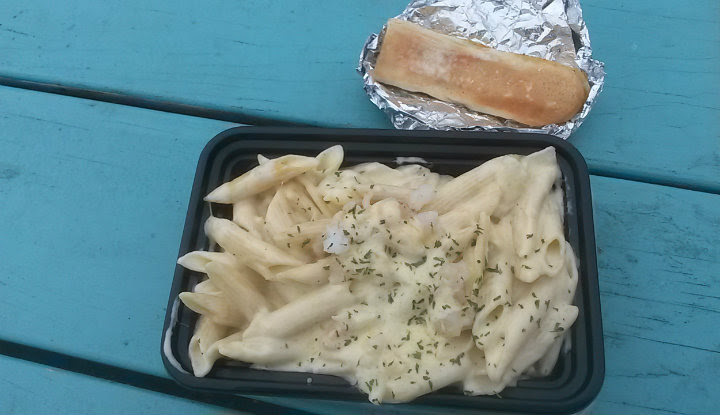 Penne was a bit past al dente. 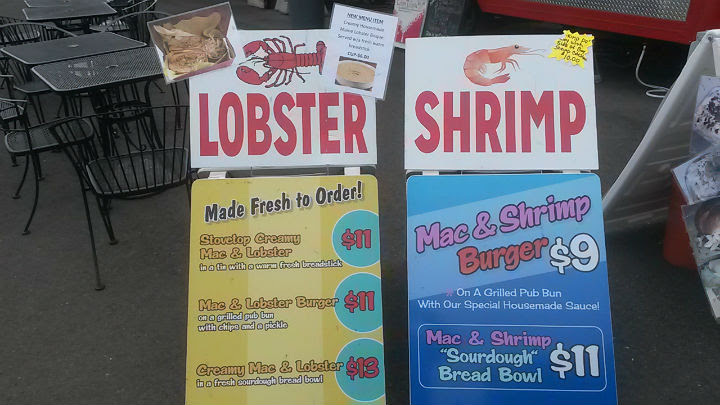 Good lobster here. 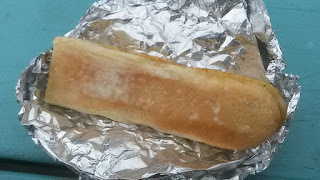 The breadstick was split down the long way, lightly buttered and toasted. Looked like I received half a breadstick, really. At the end of the day, it was a rather small portion for $11. 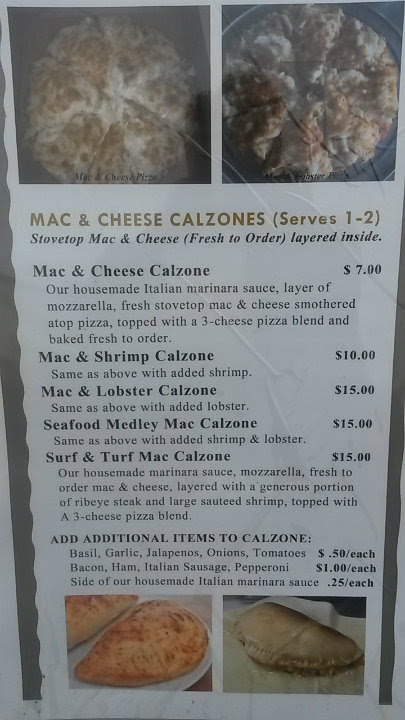 To be fair, I agree with the $5.75 price tag for the regular mac and cheese, so it's pretty much on me for getting some obviously expensive addition to this. Heck, even just getting delicious bacon added to the mac and cheese would have just been $1 more and would have totally stayed within the reasonable category. 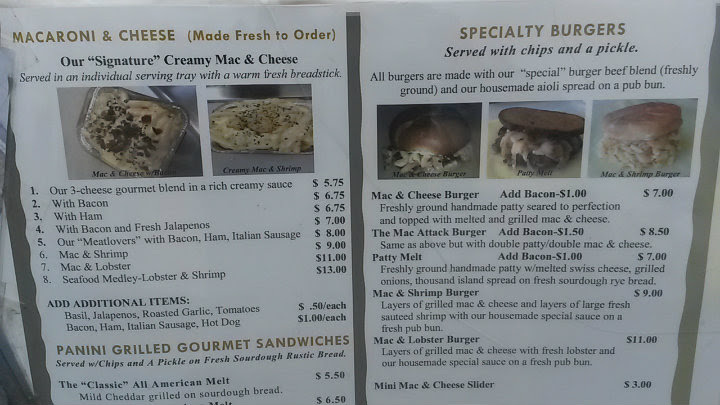 I'm sure the Mac and Cheese Burger ($7) -- or even a Mac and Cheese Pizza ($8) -- would be a better buy for my buck than the Lobster Mac. There appears to be no non-compete clause with other carts when signing a lease at Cartlandia. Frequently, there are multiple carts with similar dishes and/or the same cuisine. 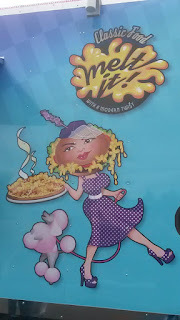 Melt It! has featured a Lobster Bisque on their Facebook page as Maine Street Lobster Company's cart remains on the lot.